We are a people business. Relationships are important to us - as is long-term commitment. It's not just the relationship with our clients that we care about but all the professionals and trades involved, because building a house is a huge team effort. Over the years we have built long-term relationships with many of our subcontractors and suppliers which means they know and subscribe to our philosophy and way of working, and they are also used to working well with each other. We regard the good relations we maintain with our clients as a key strength of KM Grant. We are still in contact with many of our past clients and continue to care for their properties. As a client, having a house built or altered can be an emotional experience and you will be investing a lot of money. So, it is crucial to choose a construction company whose team you think you can work with and who can be confident will continue to give you a service after your project is finished. The high standard of our finishes is of massive importance to us which is why we only employ skilled tradesmen. For a decorator to do a superb job he needs excellent plasterwork and joinery. The carpenters, plasterers and tilers need accurate brickwork, blockwork and screeding so that everything is square and level - and so on, back to the foundations. A tiler and stone-layer will spend hours setting out a room for the best visual effect before starting to lay. Walls painted in dark colours need to be flawless. The more minimalist the interior of a house the more accurate everything has to be. Today's new houses are required to be energy efficient and provide an extremely comfortable living environment. 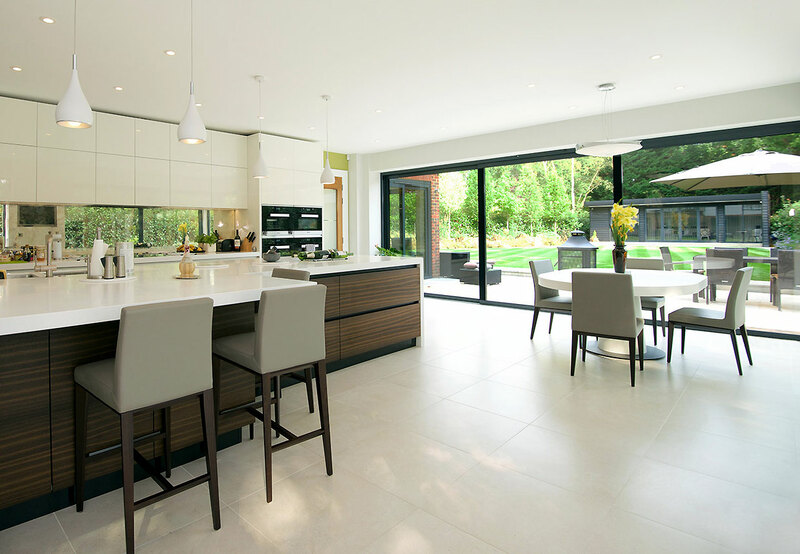 KM Grant are extensively experienced and up-to-date with modern building practices and technologies, and Building Control regulations for energy efficiency, post-construction testing for sound and air tightness, water efficiency, disabled access, waste control etc. During a house build we do our utmost to give consideration to neighbours as sites are often in close proximity to other properties and in private roads. We aim to keep the impact of large deliveries to a minimum, the site tidy, the road clean, the minimum of noise, etc. We keep neighbours informed and they are given direct contact details so that if anyone has any particular requirements we will do our best to accommodate them. © 2019 KM Grant Ltd | Site design: Kessell.